Here’s the finished product. The Certainteed Flintastic roof cap looks great! Very easy to apply. I just cut the strips on the deck, then carried each one up to the roof. The peel and stick application was simple, though at the edge of the roof, where I wanted to have the cap go up the wall of the house, it tended to be hard to lift to peel the backing off. I ended up, counter to the installation instructions, sticking the top half first. That seemed to work fine, and made it much easier for me. To make good contact, Certainteed suggest rolling with a heavy roller. I used a combination of a paint roller filled with nails, and carefully walking over the entire surface. The one thing I missed was cutting an angle at the top on the left edge of each strip. This prevents water from wicking along the joint. I’ll seal it with asphalt primer. Otherwise, this looks pretty good. We had some heavy wind and rain on the new roof, and it held up just fine. 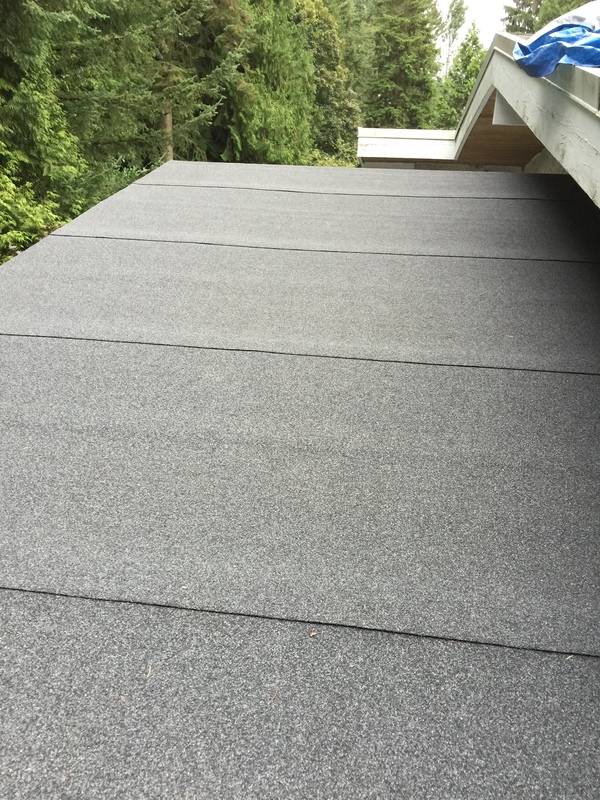 This entry was posted in diy and tagged certainteed, diy, heavy roller, roofing. Bookmark the permalink.